In 2008, William Drakeley was at a crossroads and saw this big, uniquely challenging project as a way to separate himself from the crowd. lt was a bit more than he bargained for, but he persisted -- and knows that making it all work changed the regional perception of his business. For me and my business in around 2008, this project was a real rite of passage. At that point, pool-construction and shotcrete-application companies like ours were well established and had lineages stretching back to the 1950s. Just the same, we were having a hard time gaining recognition from architects, landscape architects and developers who were pursuing quality, prestige construction. The irony is, my own firm had amazing experience in critical applications that called for precisely their desired level of excellence: There’s nothing quite like building tunnels for automobiles and subway trains to focus the mind on the fine details and the best possible construction practices, and we’d been doing that sort of work successfully for years. We were so fed up that we decided to change that context of presumption and misconception the best way we knew how – that is, by associating our business with the best and brightest watershapers we could find and getting educated along the way. One of the projects we pursued after we began participating in Genesis, an organization dedicated to top-flight education in design and construction, was just amazing – and we wanted it badly because we saw it as our ticket out of the wilderness. Trouble was, I knew shotcrete construction inside and out and could realistically build anything a client needed, but my ability to communicate what I saw as enhancements to proposed designs without facing a negative reception was still a work in progress. So I used the resources Genesis made available to me and called in Skip Phillips, one of the group’s founders and the creative force behind Questar Pools & Spas of Escondido, Calif., to accompany me on my initial meeting with the project team. That session included the architect, the general contractor, the landscape architect, the owner’s representative and others in a large mass, each one of them carrying a personal agenda. Removing the blasted rock from the old excavation was a nasty job made worse by the looming presence of a giant retaining wall. Working as quickly as we could, we shored up the wall with gravel-filled bags, then compressed new fill into place, layer by layer. We left the bags there when we placed the steel – no risk of much (if any) settlement there – and moved on to the shotcrete stage with wild satisfaction that nothing had gone wrong. The pool approach proposed by the landscape architect included a flooded-edge design in which the water would flow across the coping into a slot drain that was to run around the perimeter of the pool. Phillips and I praised the elegance of the design concept as a complement to the architecture of the home, but we went on to suggest turning things around and working with what’s now widely known as a Lautner Edge, in which water flows to the front side of the coping and vanishes into a drainage slot. It offered much the same look, we said, but removed the visual weight of the flooded coping from the overall composition while creating the same sort of uniform-deck-level effect. When we were asked how it worked, we produced sections on the edge treatment that had been prepared by a structural engineer. To say this was not something anyone on the design team was accustomed to seeing from a pool builder was putting it mildly. We’d done our watertightness test by the time we heard the word that the pool was set three inches too high. This involved us in lots of chipping and grinding, but it was understandable work. What wasn’t so understandable came soon thereafter, when the architect insisted on us inserting a remarkable number of stainless steel plates to ‘support’ coping stones that really didn’t need the help. It wasn’t as though the team immediately fell over itself to invite us into the fold, but it was clear fairly quickly that we had a real shot of winning a seat at their table. It took a month of back and forth and further communication, but finally there we were, seated right where I had always thought we belonged. And we did belong, because this was something we knew how to do. But every once in a while with projects like these, you shoot for the stars then wonder why you ever went after the project in the first place. As mentioned above, this was truly a rite of passage. The site itself had some history. Construction had started about ten years earlier at the behest of a couple who were deeply involved in the art world. The plan had always included a pool, so when the contractor installed the huge retaining wall that still rises above the deck, he also blasted away an amazing quantity of rock so that subsequent pool excavation would be easier and wouldn’t risk affecting the adjacent wall. The footing for the exposed eight-foot-tall wall went eight feet below the surface as well. The future pool’s pit had been refilled with the blasted rock, which was nothing we could build on, so we had to dig it all out and start over with properly compacted fill. Here was the first problem: The original excavation hit bedrock 16 feet down. The wall’s footing only went down eight feet, and the soil behind the exposed, finished part of the wall rose nearly to the top on the back side. As a result, we had to figure out a way to shore up the wall as we cleared blasted rock down to eight feet beneath the footing – and do so knowing how much pressure the soil behind the wall was exerting to make it topple into the pit. Our work was effectively done well before work on the house and landscaping concluded, which left us with plenty of opportunities to have our work closely examined by other professionals who came on site – a fact that worked nicely into our desire to impress them with what we could do. So we developed a system: We started by digging a trench behind the wall to make certain we could channel any rainwater away before it could add to the pressure behind the wall. Then we brought in burlap bags filled with gravel and used them to support the wall soil on the pit side as we went deeper. The upshot was that what could have been a routine excavation became something of a life-or-death exercise in force and counterforce. It took us two weeks of utterly furious effort to clear the blasted rock down to competent material while making certain the wall stayed where it belonged. Lift by lift, the floor of the pool rose to the right level. We left the gravel-filled bags in place, set the steel cage and pipes and installed the concrete via the shotcrete process. To say that completing this phase was a relief is putting it mildly. So the shell was complete and we were ready to begin with finishing touches. That was when we heard some interesting news: A project foreman, subsequently fired for other reasons, had set and signed off on the level at which we’d installed the top of the bond beam. The new foreman went bananas, because it turned out his predecessor had been off by quite a bit with the result being that our pool was three inches too tall for the decking system to work. No problem, I replied. We’d built the bond beam with five inches of clearance to the reinforcing bars, so all we had to do was chip away the top three inches – which would still leave us with the two inches of steel coverage mandated by the American Concrete Institute for rebar exposure in non-moisture or non-soil areas. It was far from fun, but it prevented a major crisis. And did I mention this was a rite of passage? The house itself is a literal work of art, with projectors covering its walls in a variety of images from floral to fluid and beyond. But our pride is defined by the beautiful swimming pool – and the pleasure we took in adding impressive, beautiful images like these to our portfolio. So then came the third and final test – one that really tried my patience but that had to be endured to make the architect happy. Knowing the thickness of the coping stones and the unusually large size of each piece, we had every confidence that we could cantilever the huge slabs of marble over the drainage trench without any need for additional support. But the architect wouldn’t hear of it and kept asking if we could guarantee no cracking or failures would ever occur. We even rolled a pickup truck over a slab to prove its strength, which was bizarre but we thought it might help. Still it was no, he wouldn’t be satisfied – so we ended up grinding away another fractional slice of the bond beam to allow for insertion of stainless steel support plates around the full perimeter of the pool. Wall to wall, working on this project was stressful beyond belief, but by the time we reached the steel-plate stage, we had the hides of a herd of rhinos and even the architect’s insecurity was something we could take in stride. Well, almost. By now we were on the home stretch, concluding our participation by applying tile and plastering the pool. Finally, we had the opportunity to stand back and see just how incredibly well everything had come together; how beautiful the retaining wall looked as it loomed over the pool; how amazing the marbled granite decking looked, especially when the sky was cloudy and reflections off the pool’s surface interacted with the striations of the surrounding deck; and how well the pool fit with the architecture – a seamless, gorgeous composition. One more point to mention: The home itself is a giant “screen” against which projectors hidden in the bushes shoot various images. 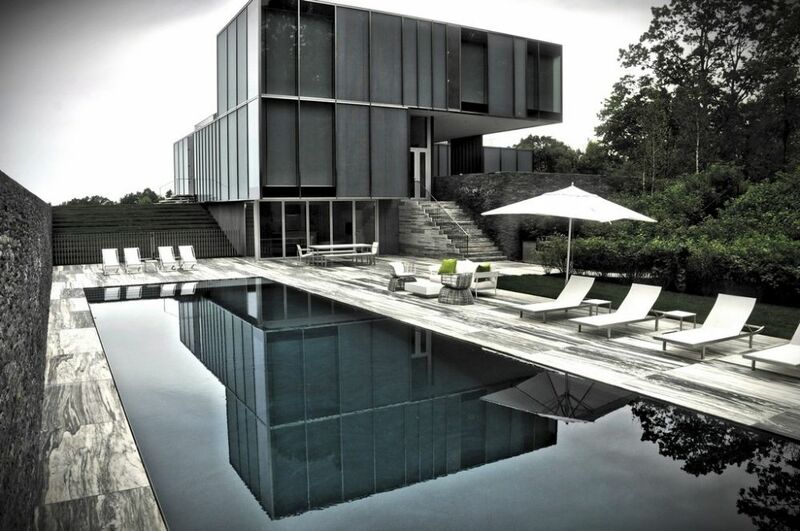 It’s a stunning effect that intensifies the sense that everything on the property is a work of art, our pool included. Funny story: One day when I was driving onto the property, I spotted a fallen tree that had clearly been hit by lightning. As a courtesy to the homeowners, I was prepared to cut it up and remove it. Upon closer examination, however, I discovered that the “tree” was another piece of art – made of stainless steel fabricated to look like a lightning-felled tree and definitely not anything I should have taken after with my chain saw. It was always that sort of strange and surprising project, but I have to say that our success here had exactly the desired effect: Before long, we’d gone from being local pool guys to being a go-to, region-wide resource for complex construction processes related to water. We survived our rite of passage and have never looked back.